Have you or your loved one been struck down by the dreaded lurgy this year? It seems as though the cold and flu viruses making the rounds are particularly virulent and brutal, dropping even the most hale and hearty among us. Fortunately (touch wood), the specter of sickness has passed over us to date but when I do start to feel under the weather I have two secret weapons I bring out to fight off whatever bug has tried to take up residence in my chest. The first is Sambucol, passed on to me by a dear running friend. 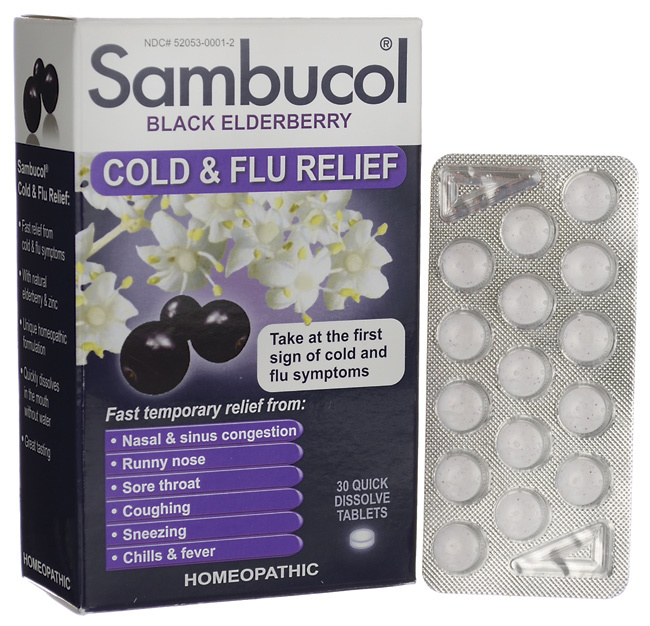 Sambucol is a homeopathic remedy based on Black Elderberry Extract which has antiviral properties particularly powerful against different strains of influenza virus. It also boosts your immune system to help fight off the illness. I’m always a little skeptical about, well, most things, but this one truly works! Don’t believe me? Here’s a study by the NIH saying same :-). I dissolve one tablet on my tongue every 3 hours from the moment I start feeling that tell tale scratch in my throat until I feel better. I find it might take a few days but truly, it really does work. Be forewarned though, the apple cider vinegar really helps clear out your sinuses! I promise you. After popping a few of the Sambucol tablets and curling up on the couch under a cosy blanket with a cup of Hot Honey Lemon Tea you’ll feel brand new. Or if not completely new, new enough to face the rest of the day. ← The Catalogues are Coming! The Catalogues are Coming!